Sub: Appointment on Compassionate Grounds – Priority No. 1 case- reg . Attention is invited to this office letter para 10 (i) and 10 (c) of Board’s letter No. E(NG)II/90/RC-1/117 dated 12.12.1990 wherein it had been laid down regarding order of priority in offering appointment on compassionate grounds. Priority No. 10 (i) ~ Dependents of employees who die or are permanently crippled in the course of duty and 10 (c) – a time limit of one month should be observed within which appointment should be given and Para 6 of Board’s letter No. 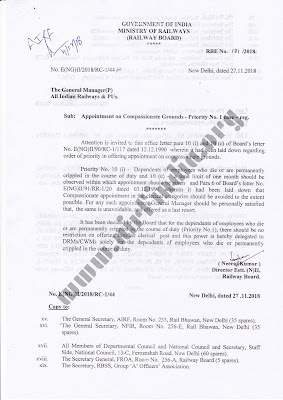 E(NG)II/91/RR-1/20 dated 03.12.1991 wherein it had been laid down that Compassionate appointment in the clerical categories should be avoided to the extent possible. For any such appointment, General Manager should be personally satisfied that, the same is unavoidable, and offered as a last resort. 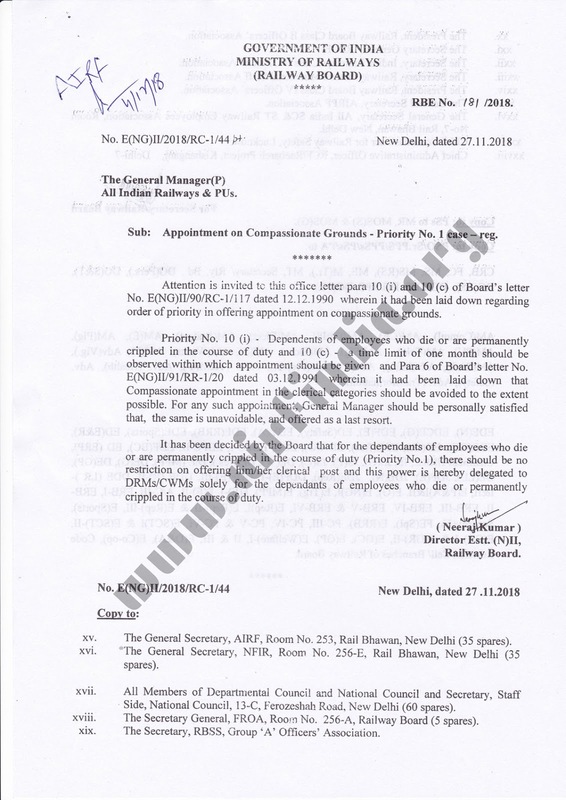 It has been decided by the Board that for the dependents of employees who die or are permanently crippled in the course of duty (Priority No.1), there should be no restriction on offering him/her clerical post and this power is hereby delegated to DRMs/CWMs solely for the dependents of employees who die or permanently crippled in the course of duty.